44mm Headtube and ISCG Mount are fantastic! ¿Are you sure on headtube ID numbers? 44m ID = semi-integrated 1 1/8″ headsets. Taper or 1.5″ are bigger! Edgar dear, yes, I am sure. Loving the new frames and graphics, especially the brochure with the sheep, brilliant! All I know is I’ll take pritty much one of each… I’m loving the inclusion of ISCG mounts on this frame – although I have blue pig X jealousy and hanker after a longer travel bagger. 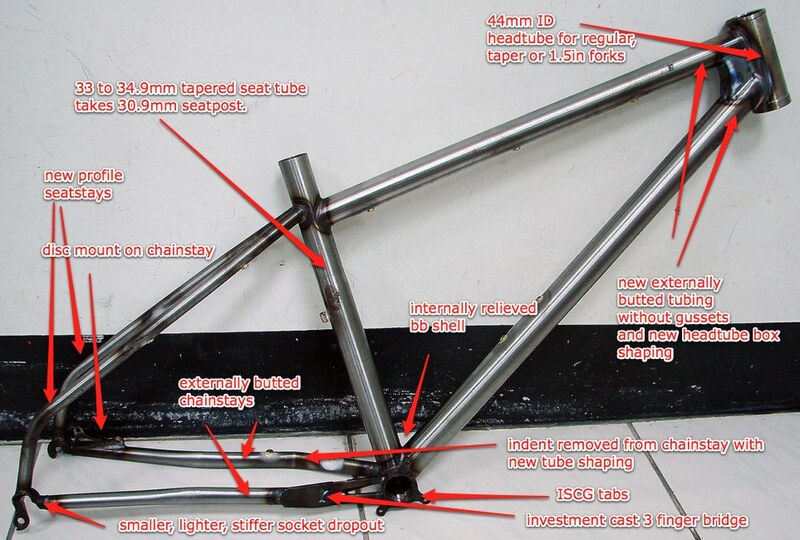 I also like the look of the QED – I don’t know what the draw of building a Singlespeed hardtail is, but I want one! I have the 20inch ‘old’ pig frame and it rides real well. Comparitive trail comfort to my 6 inch travel full susser – although I haven’t had the chance to really get it out there on a big test as I’ve only just finished building it recently. I now wish I’d waited till these frames came out before I started my hardtail build – darn you! That’s a interesting bend in the seat stay. What was the thinking behind that? I imagine it would improve the rear compliance over bumps……? I puzzled by this because it looks like it requires more material to make this bend in the seat stay which would add extra weight to the bike. Cool! Is the first 44mm ID headset that i see with external bearings. My giant have a 44mm ID headtube and comes with a zero-stack semi-integrated 1 1/8 headset. Looking good. Like your thinking on the headtube. Sorry if I missed it somewhere, but will the geo be modified vs the current pig? My riding friends all find the BB height of the pig too high w/ 140 mm fork. I need a 20″ black 2009/2010 Blue Pig in the UK now. Are they a myth as no-one has one. 20in original model Blue Pig’s are sold out and have been for a while. Sorry. So how long until the 2011 Pig or Pig x hit the shops? Will santa be leaving me bereft of steel. Is there an update on when the new Pig will be in the shops.? CRC are listing February 20th right now. Brant, can you please confirm whether the new Pig is heavier than the old one and what is it? Also what is the weight difference between the new Pig and Pig X? The new Pig is lighter than the old one by an ounce or so at least. And the Pig X is lighter by a good couple of ounces too. Proper weights when we have proper frames in front of us. do you have an actual weight of the bluepig x frame yet and any pics of the blue version ? really wanna see one before i decide to buy. they seem to be in stock with various retailers but still no pics ?